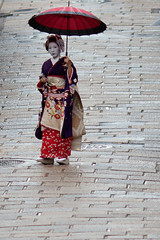 A very helpful Flickr user posted a response to my photo “Geisha of Gion”. I thought I’d share the response, as I wasn’t aware of this at all. (Even after reading Memoirs of a Geisha 😉 ) I feel like such a tourist. “Sorry, but this lady is just a regular lady dressed up as a maiko (an apprentice geisha) for the day. This act is called “henshin”. But this is a lovely composed picture! (2) her hair ornaments don’t match the season. October kanzashi look like this:www.flickr.com/photos/angelkwan32/2946257915/ for junior maiko and thiswww.flickr.com/photos/mboogiedown/291371873/ for senior maiko (i.e. it is chrysanthamum). her ornaments look like fuji perhaps (looks like this:www.flickr.com/photos/8052859@N02/3989659123/ ) which are for may. (3) Her collar and tied obiage (red little belt above the big obi-belt) signal that she is very senior, but she has bright red hanao (shoe straps). Senior maiko wear pink, purple, and blue (in order of seniority). (4) other things is that the condition of the red strands in her hair is poor (I real maiko okaasan would retire these before they become this condition) and she is too old to be a maiko (maiko in Kyoto are between 15-20 (21 is kind of really pushing it) years old and this lady is beyond that (although this can be hard to tell).